Genuine WWII US TL-29 electrician's pocket knife, manufactured by Camillus. The latter has two blades, one regular knife blade, and a screwdriver blade. Genuine WWII US M-1936 rubberized field bag dated 1943 and manufactured by Myrna Shoe Inc.
Genuine WWII US M-1938 leggings, size 3R, dated November 3, 1942, with original laces. Genuine WWII Combat Medic Badge, pin back. 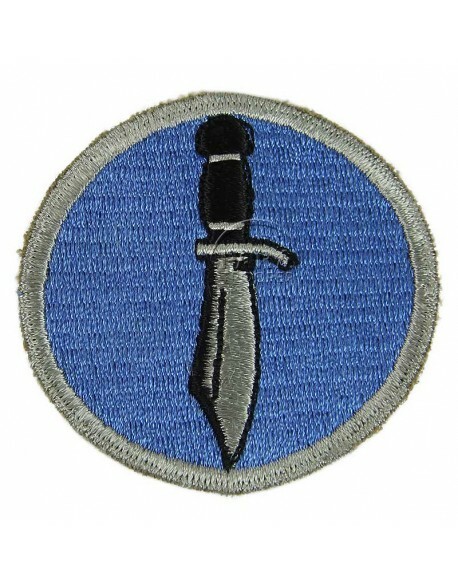 Issued to medics who have seen action. Worn on the dress uniform or jump jacket (see Doc McIlvoy book p.161 for more info). Genuine WWII US hypodermic needle sterilizer, marked USA M.D. (Medical Department) and manufactured by Pioneer. This small burner was part of the officer and NCO medical bag. It was dropped when the hypo syringe was replaced by expendable syrettes in these bags' contents. See Collector's Guide, Tome 2, page 189. Genuine WWII US empty metal box, empty, for 12 iodine swabs. Medical Item #9767500 Perfect condition. Genuine WWII US Marine Corps camouflaged poncho, NOS, unissued condition, dead stock. Also used on D-Day by the Naval Beach Bn. on Omaha et Utah Beach. Dated USMC September 17, 1942, Archer Rubber Co.
Genuine WWII US Marine Corps camouflaged poncho, NOS, unissued condition, dead stock. Also used on D-Day by the Naval Beach Bn. on Omaha et Utah Beach. Dated USMC 1944, The Walker Co.
Genuine WWII Taylor plastic wrist compass with leather adjustable band which was heavily used by US airborne troops. Rare genuine WWII US glass bottle, WITHOUT rubber stopper used for plasma or whole blood transfusion. Genuine WWII US 1 liter bottle made by Owens for the Baxter's laboratories. This bottle was used for blood drips or saline solutions drips. Perfect condition. Genuine WWII escape compass or bottom compass in brass painted in OD green which was in MAPS ONLY pocket. Genuine WWII US M-1936 rubberized field bag dated 1941 and manufactured by Atlantic Products Co.
D-Day 06.06.1944 Monopoly game box. 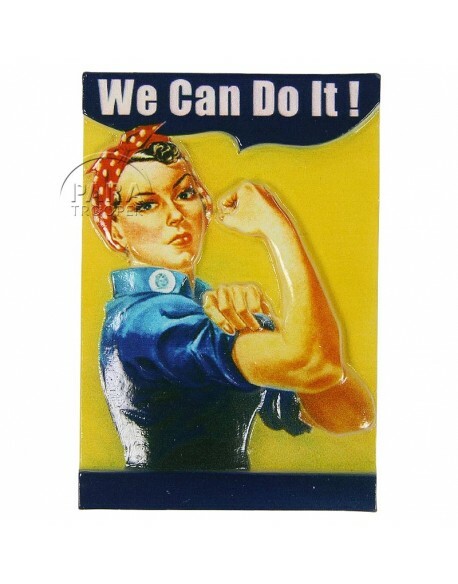 1 gameboard, 6 tokens, 28 title deed cards, 16 We Can Do it! cards, 16 allies cards, 1 pack of monopoly money, 32 camps, 12 Headquarters, 2 dice, English and french rules. 27 x 27 x 6.5cm. 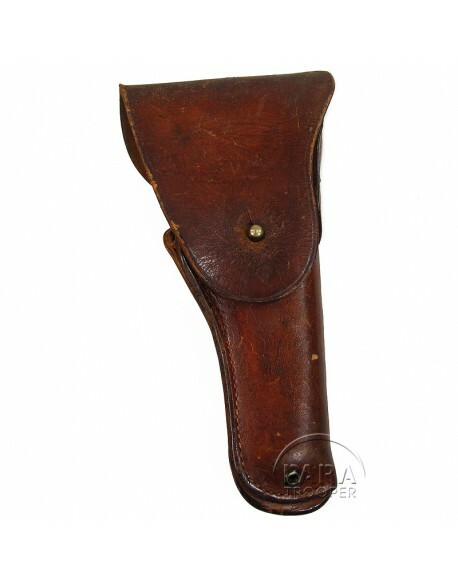 Genuine WWII US shortened M-1905 bayonet for the M1 Garand rifle. It will be renamed M1 from March 1943. Shortened by Union Fork & Hoe (UFH) as a combat knife style. This bayonet is dated 1942, marked U.C. on the blade. Complete with bakelite OD scabbard. Genuine WWII US shortened M-1905 bayonet for the M1 Garand rifle. It will be renamed M1 from March 1943. 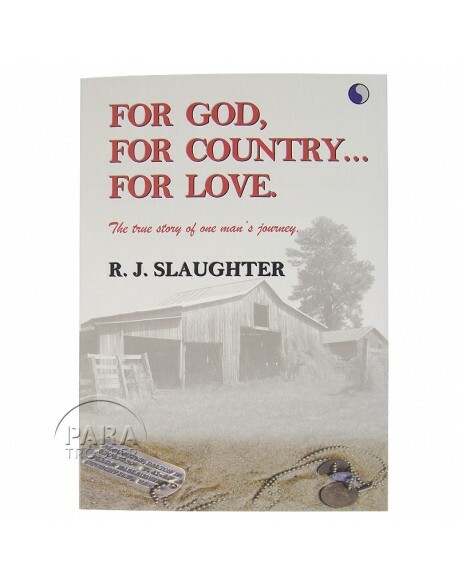 Shortened by Union Fork & Hoe (UFH). This bayonet is dated 1942, marked UFH on the blade. Complete with bakelite OD scabbard. 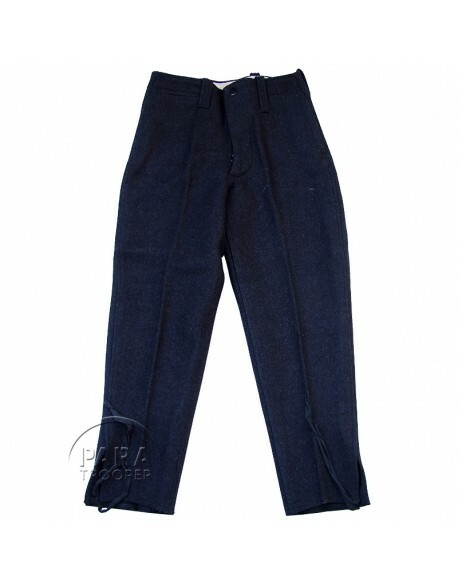 Genuine WWII US Navy heavy grey wool trousers worn in extrem cold weather in US navy submarine. Close by buttonhole (5 buttons), with its genuine label, manufactured by Bradford Clothes Inc. in 1944. US size 36. Mint condition. Genuine WWII US M-1936 field bag dated 1942 and manufactured by Atlantic Products Corp. That musette bag is in excellent condition. 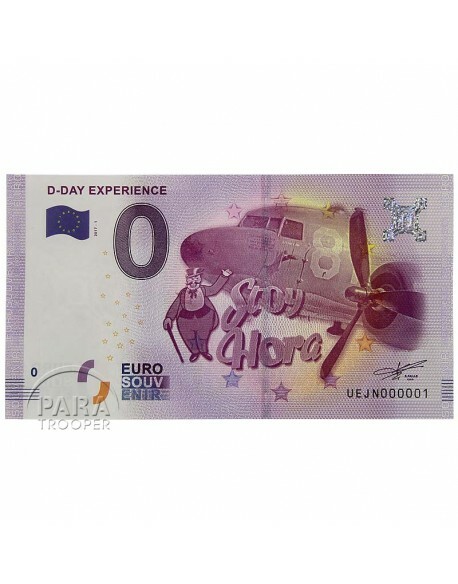 Issued in lieu of the haversack to officers and other personnel such as airborne troops and armored crew. Genuine WWII Sterling silver US Army pendant, sweetheart, heart-shaped, two-sections oping to hold personal pictures. 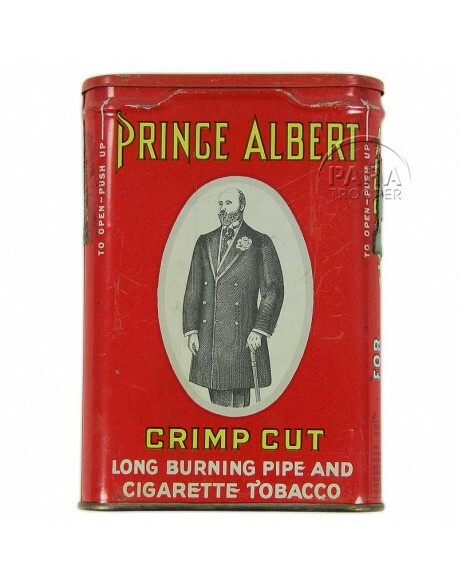 Manufactured by S & C. Often bought in PX for their girlfriend. Genuine WWII pearly and gold metal US Army Air Force sweetheart with pin fastener. Worn by soldier's mother. 35 x 35 mm. Genuine WWII gold metal US Army sweetheart with pin fastener. 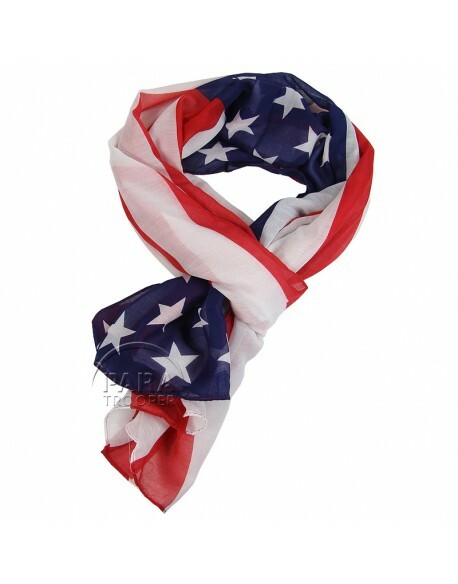 Worn by soldier's wife. Genuine WWII pearly and gold metal US Army sweetheart with pin fastener. 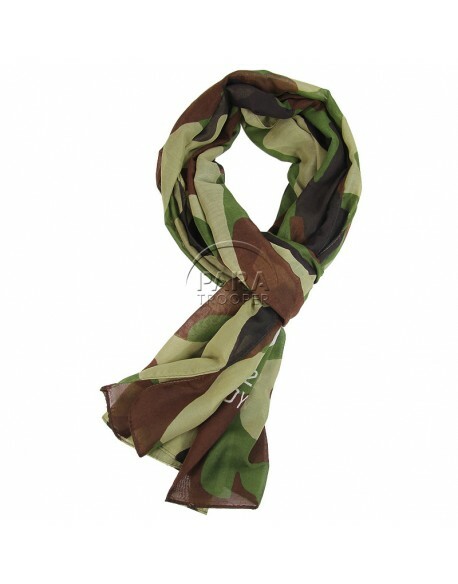 Worn by soldier's wife. 40 x 25 mm. 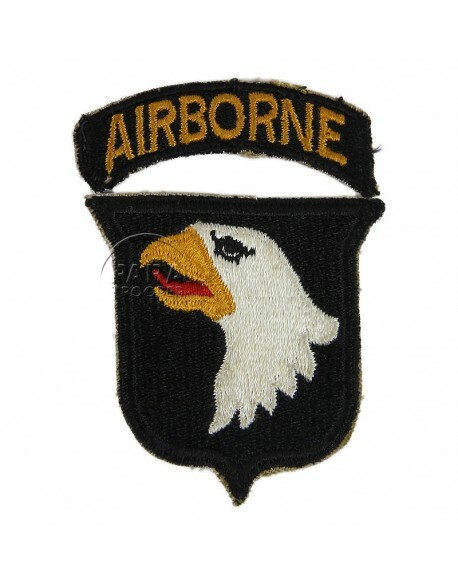 Genuine WWII US shoulder sleeve insignia of the 101st Airborne Division, The Screaming Eagles, which jumped in Normandy D-Day. 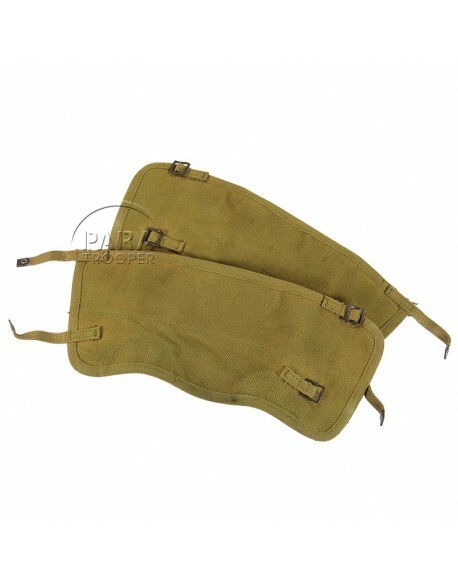 Superb genuine WWII, NOS, US medical pouch in khaki canvas, adjustable with a lace. 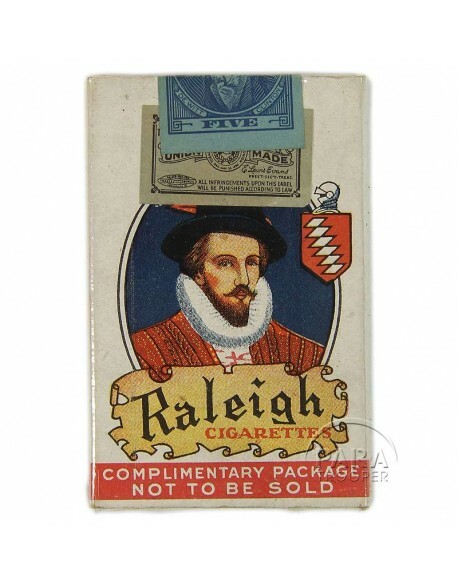 Never issued, mint condition. Delivered with a long strap. 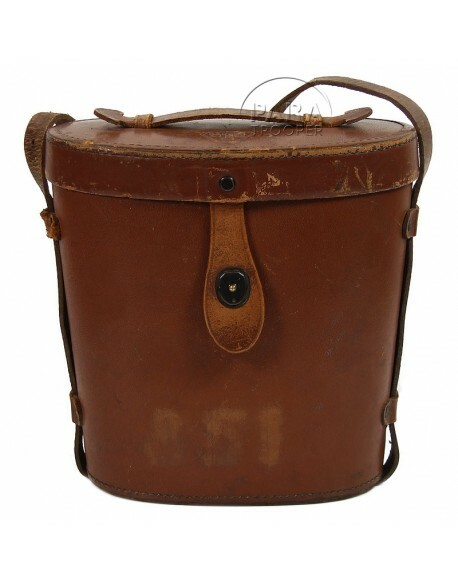 Genuine WWII US M-1938 map case complete, manufactured by HOFF, dated 1942. 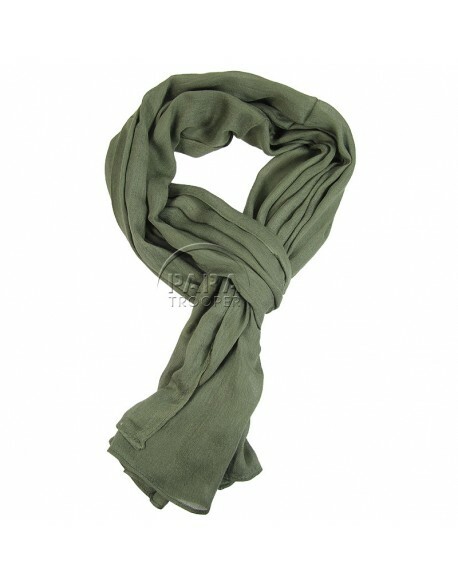 Delivered with its genuine strap but without rhodoïd. 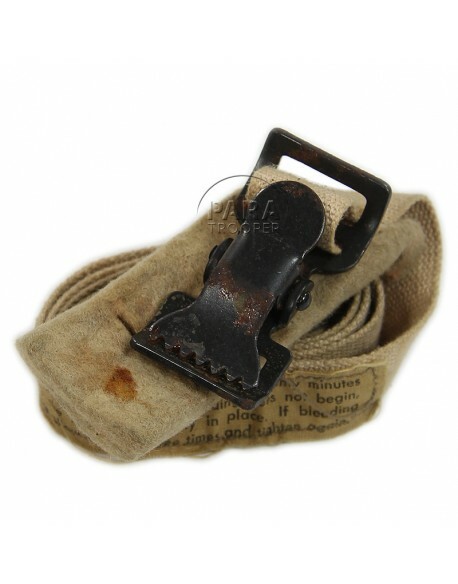 Genuine WWII US for the US Army extension strap fitted with a snap hook. 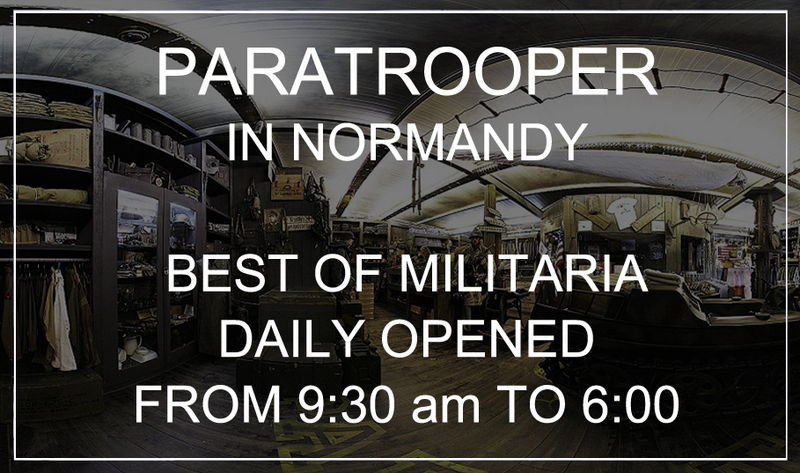 Often used by paratroopers as it made the canteen attachment more secure. 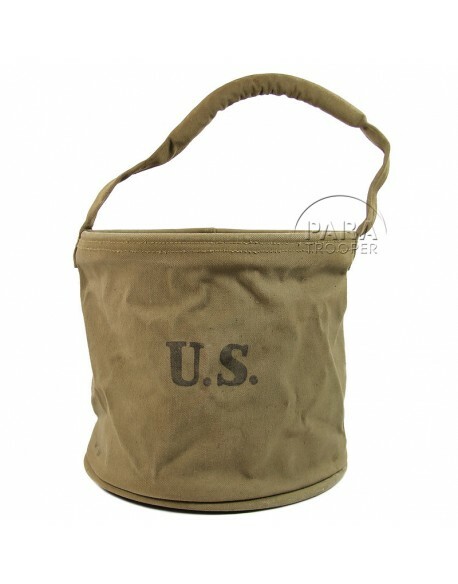 Genuine WWII US khaki M-1928 carrier pack, well marked and dated 1944 by the manufacturer B.B. 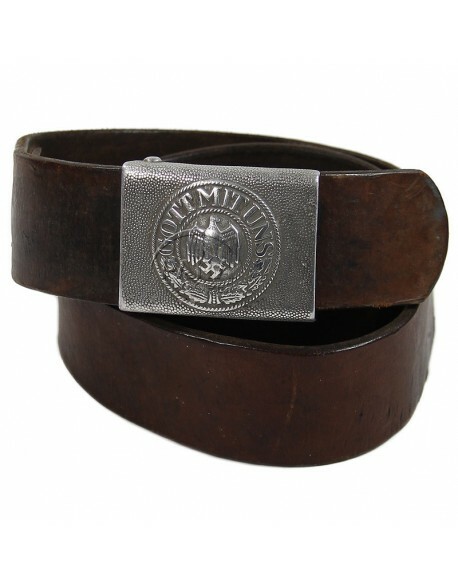 Co.
Genuine WWII Engineer Corps silver bracelet (sterling) with a sterling silver insignia. Belonged to Lander Van Gundy asn 36770748. Genuine pre-WWII chromed brass bracelet (sterling) engraved with the name of a US Army soldier. Ernest Pyle. 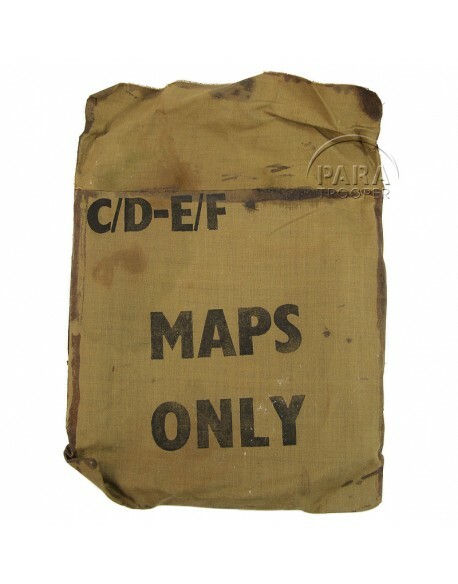 Genuine WWII US M-1936 rubberized field bag dated 1942 and manufactured by Atlas MFG. 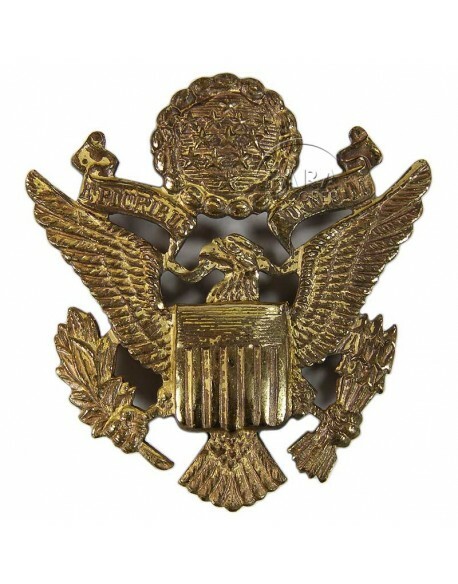 Co.
Genuine WWII US shoulder sleeve insignia of the 101st Airborne Division The Screaming Eagles which jumped in Normandy D-Day. In two parts. 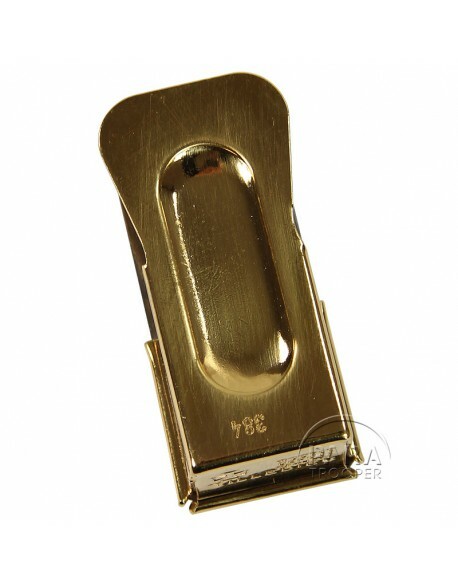 This type 4 SSI has a sharper beak, wider shield, and is issued with a narrower separate tab. Cotton thread, 100% WWII made. Genuine WWII US Kiska Task Force patch, worn by men of the task force deployed for the Assult on Kiska island (Aleutian island). 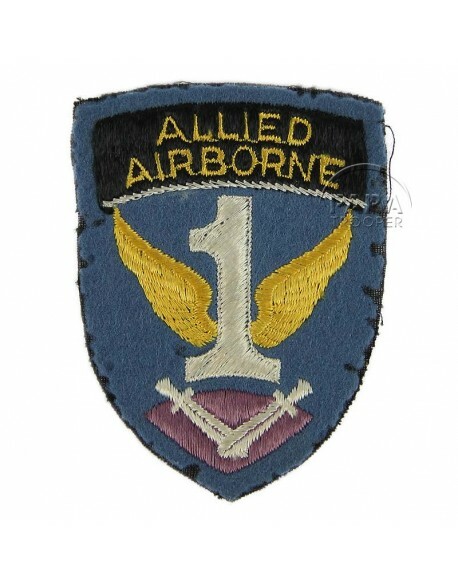 Genuine WWII US First Allied Airborne patch, in felt, worn by airborne troops on Ike jacket or dress uniform. 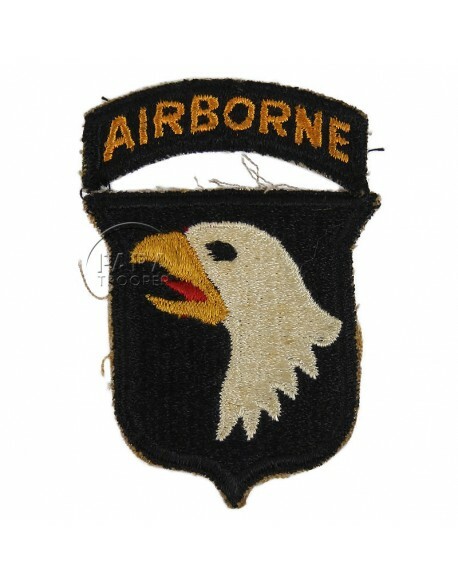 Scarce genuine WWII US shoulder sleeve insignia of the famous 101st Airborne Division, The Screaming Eagles, which jumped in Normandy D-Day. This is the RARE white tongue model with OD green back, made in 1942. With seperate Airborne tab. Very nice genuine WWII type Q-1B rheostat used in high altitude in bomber planes from the US Army Air Force. 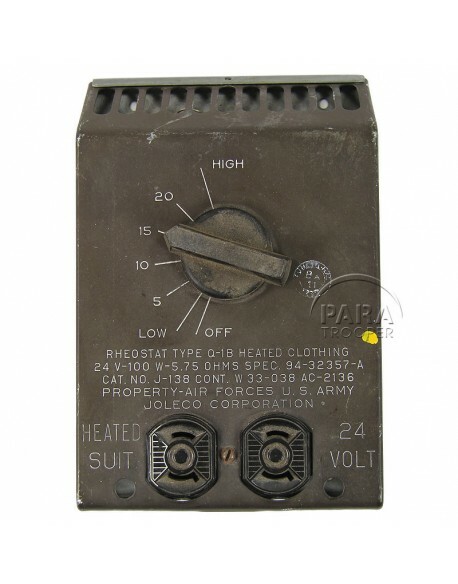 This provide variable power for a heated flight suit like F1, F2 and F3. Mint condition. Nice genuine WWII US Army Air Force saw blade wrapped in its genuine waxed paper. Part of the escape kits designed by the MI9 in 1942. 4" x 0.5". Genuine WWII shoulder sleeve insignia of the 2nd Armored Division Hell On Wheels, made in 1943 with a green back manufacturing. 100% coton. Superb genuine WWII USM3 knife made by PAL, marked on blade, delivered in an USM8 bakelite sheath, manufactured by B.M. Co. (B /3 N). 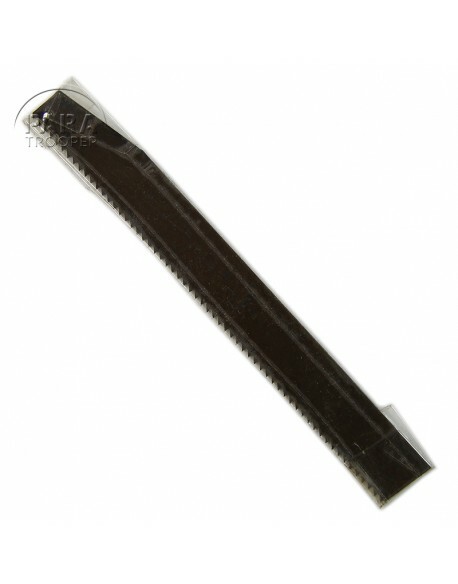 Blade length: 17 cm / 6.70". Genuine WWII US M1 Garand rifle cartridge belt, 10 pockets, manufactured by Burlington Mills Inc. and dated 1942. This belt has some rust stains. 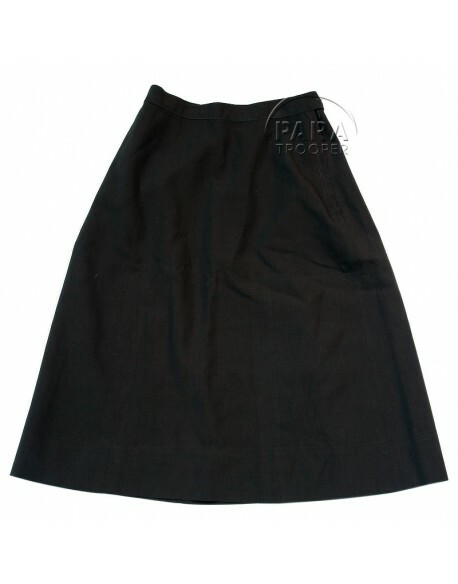 Genuine WWII US officier woman skirt, dark OD, chocolate. 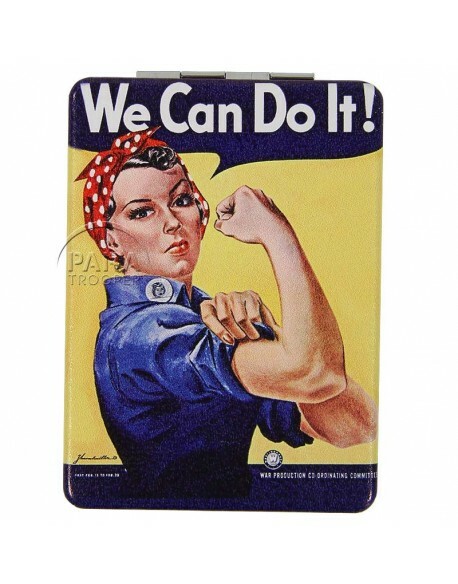 For Nurses or WAC. Zip was changed. In perfect working condition. Waist 14". 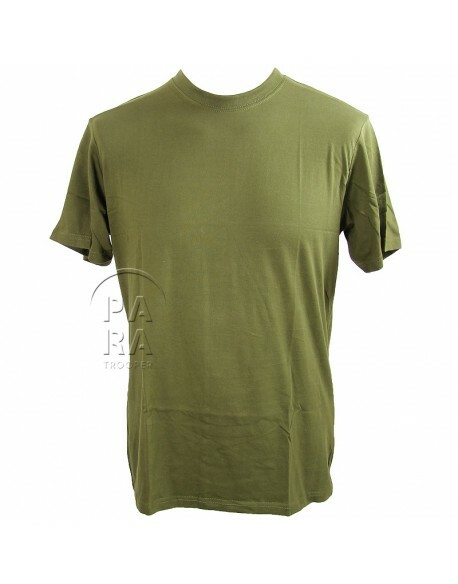 British-made genuine WWII paratrooper / infantry gas brassard. Made out of heavy brown paper coated with reactive paint. When in contact with vesicant spray, the paper would turn pink in spots. The cloth loop was for attaching the detector to the field jacket shoulder strap, most of the time on the right arm. 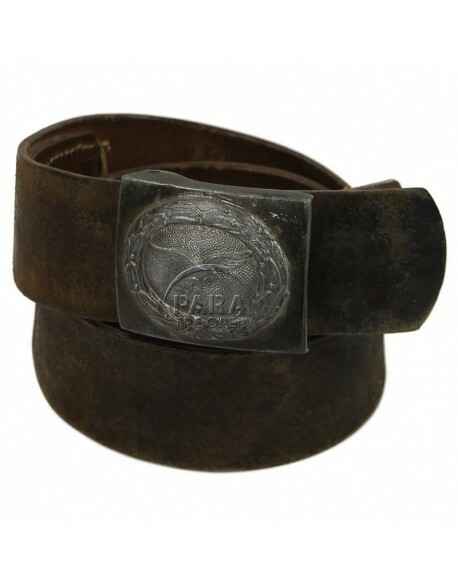 British-made genuine WWII paratrooper / infantry gas brassard. Made out of heavy brown paper coated with reactive paint. When in contact with vesicant spray, the paper would turn pink in spots. The cloth loop was for attaching the detector to the field jacket shoulder strap, most of the time on the right arm. Well marked and dated 1943. 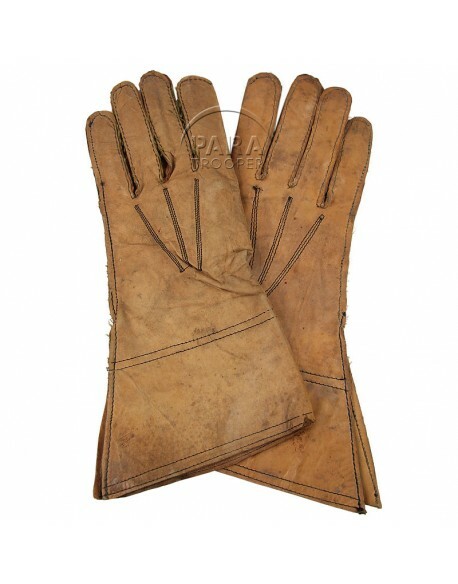 Superb genuine WWII pair of British gloves, in leather, dated 1943, mainly used by motocyclists and armored troops. Size 9. 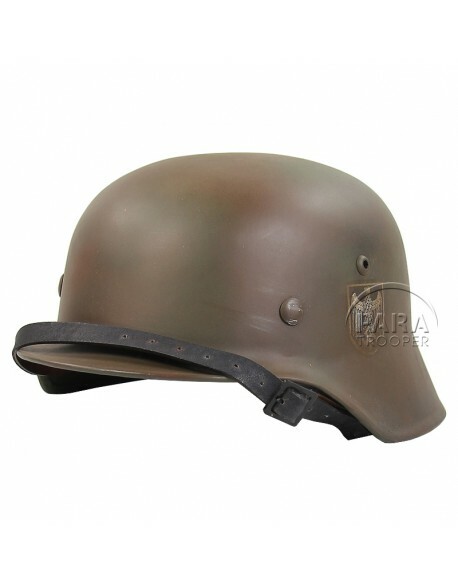 Genuine WWII Canadian army small mesh helmet net, 3-tones camo brown and green. Very good overall condition. Also seen being worn on US helmets. Nice pair of genuine WWII Canadian leggings in canvas and leather, dated 1942, worn by all Canadian units. Superb reproduction of the famous cricket used by paratroopers of the 101st US Airborne Division on D-Day. 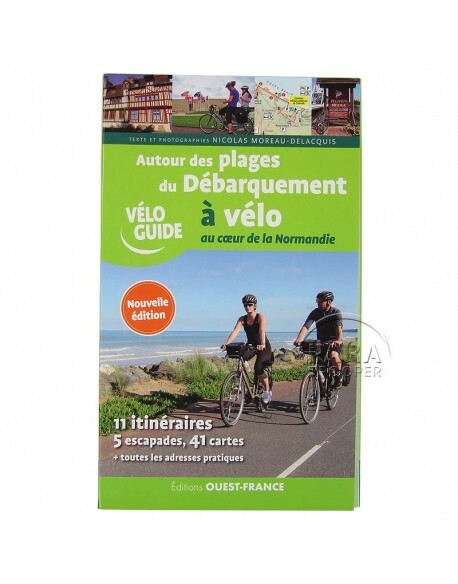 Made in Normandy, France. WARNING! 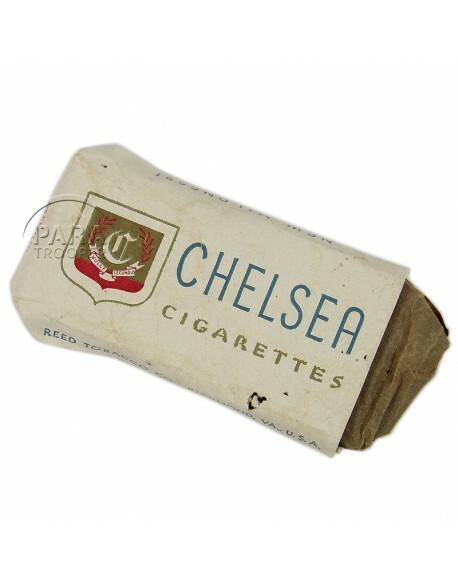 Limited edition: 1944 crickets only. Numbered. Gold-plated, 24 carats. Genuine WWII US Marine Corps camouflaged poncho, NOS, unissued condition, dead stock. Also used on D-Day by the Naval Beach Bn. on Omaha et Utah Beach. Dated USMC 1945, Archer Rubber Co. with red ink. Very nice genuine WWII Heer/Waffen-SS M44 type breeches with leather seat, in Italian gabardine, very good condition, stamped with the size and the date (1944). 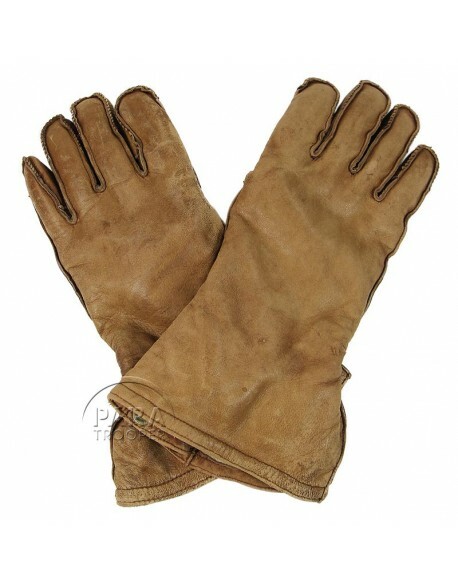 Excellent condition, leather very soft. 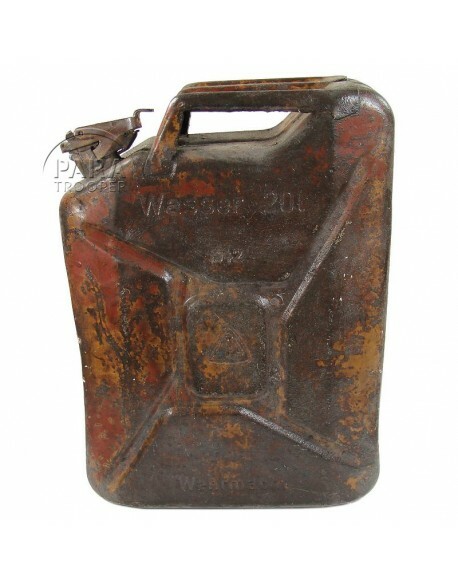 Genuine WWII German jerrican dated 1942 made from pressed steel used to hold 20 Liter of drinking water. 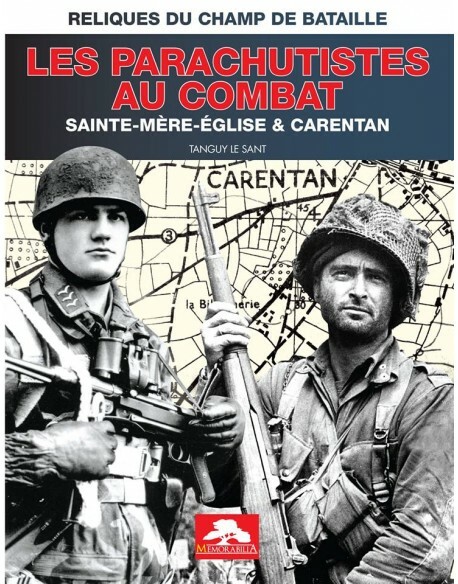 Found many years ago in Carentan area. 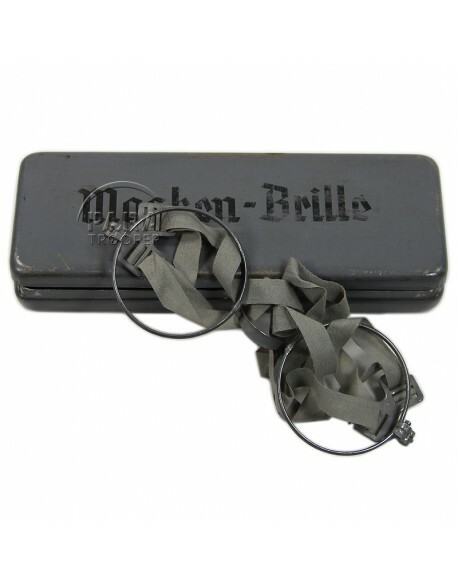 Genuine WWII German aluminum tin case for ammunitions packed in belt for the MG 42. Originaly painted. 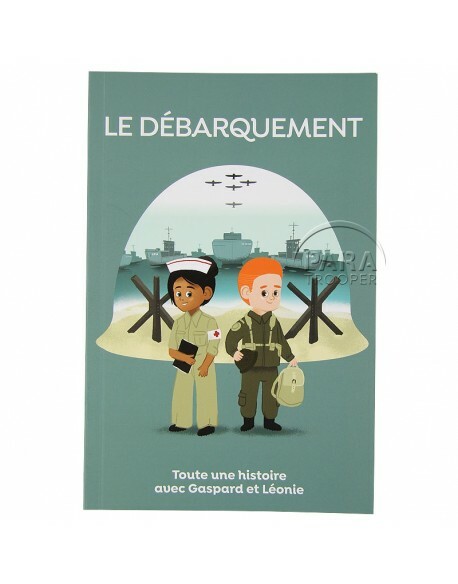 Find many years ago in Carentan area. Pair of Genuine WWII US M3 binoculars, 6x30, manufactured by Nash-Kelvinator and dated 1942, optical in very good condition, comes with leather case type M17 manufactured by Bausch & lomb. Genuine WWII US compass used by US officers and US airborne troops, carried in a waterproofed canvas case. Manufactured by W. & L. E. Gurley. Very nice genuine WWII US M1 Garand rifle cartridge belt, 10 pockets, manufactured by R.M. Co. and dated 1942. 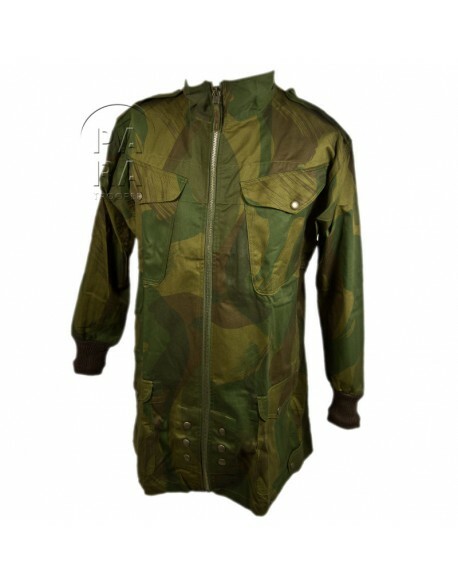 Genuine WWII US M6 carrier in OD green canvas, marked Army Lightweight Service Mask, which contains service gas mask M3 (dated 1943) connected to a M10 canister by a tube. 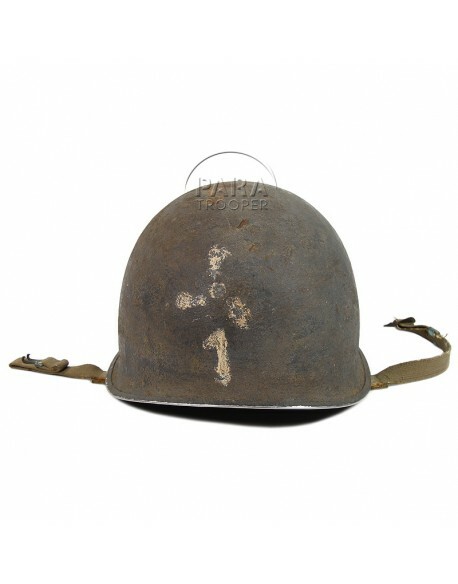 This kind of mask was mainly carried by gliders and glider pilots during D-Day. 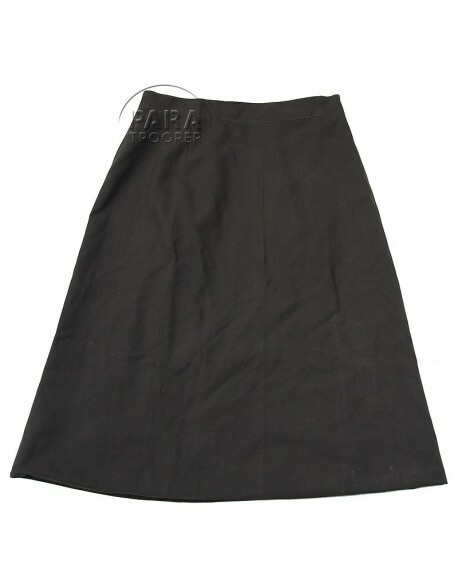 Genuine WWII US officier woman skirt, chocolate. For WAC or Nurse. Zip manufactured by Talon. Waist 12 1/2". Genuine WWII US OD light shade wool serge trousers, Special type. This is the standard issued wool trousers, with an early anti-vesicant Special feature ; there is a triangular flap behind the fly. Size 33 x 29, with illegible label.Belonged to the T/5 soldier named Tadius J. Zientara 31399513. Genuine WWII complete US canteen. Canteen manufactured by R.S.E. dated 1943, cup by E.A. Co. dated 1943. 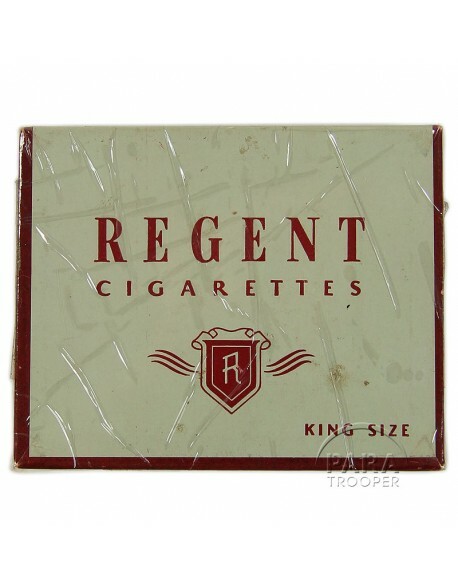 This set is delivered in a very nice khaki cover manufactured by Appleton Awning Shop and dated 1942. 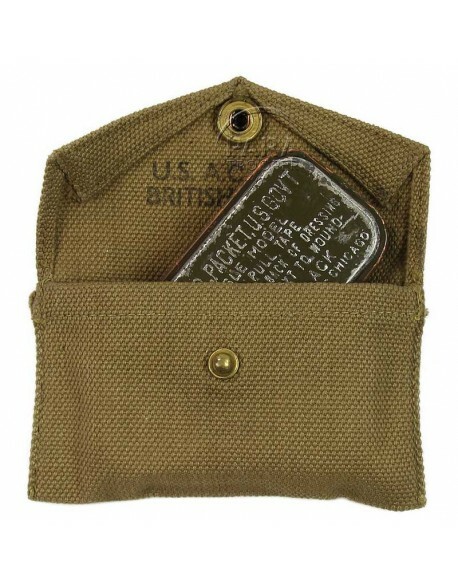 Superb genuine WWII US first aid pouch in khaki canvas with its original first aid in metal box. 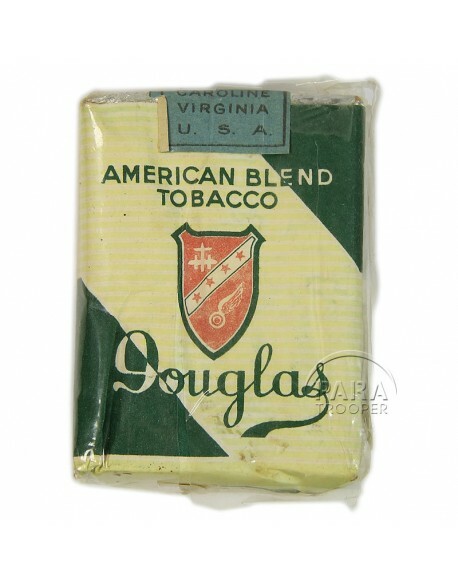 Dated 1944, British Made for the US Army, manufactured by U.S. A.C. Hard to find nowadays in that mint condition. 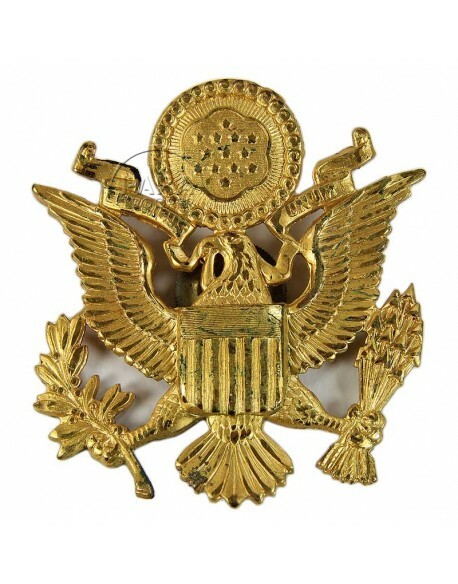 Superb genuine WWII pair of US officer collar insignia for Nurse, clutch on back and manufactured by A.E. Co. Utica. 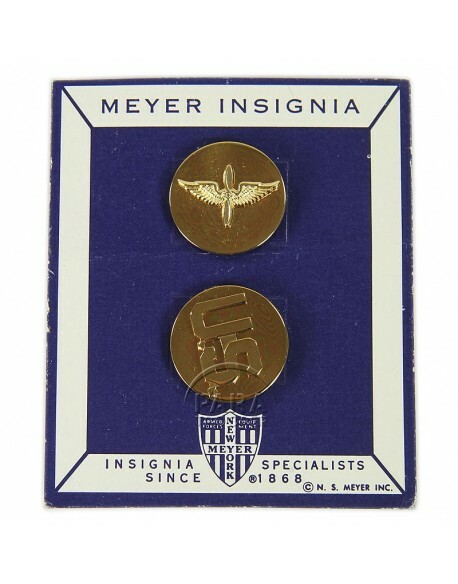 Set of Genuine Post-WWII US enlisted men USAAF collar disk, perfect to complete your Class A jacket. 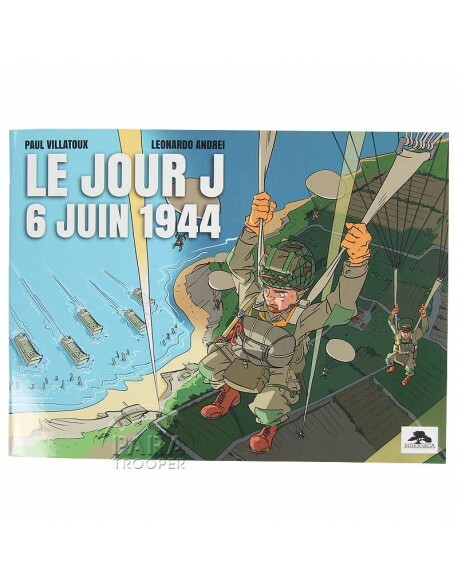 Superb green baseball cap marked D-Day - 1944-2019 75th Anniversary Operation Overlord. Adjustable size on rear. 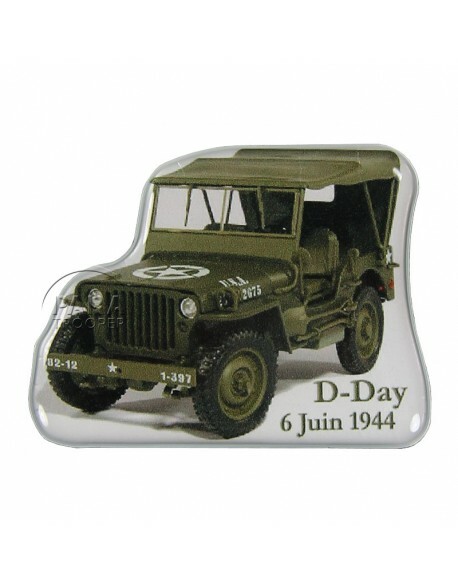 Canvas 75th D-Day landing anniversary 1944 - 2019 key chain with different flags on the back. 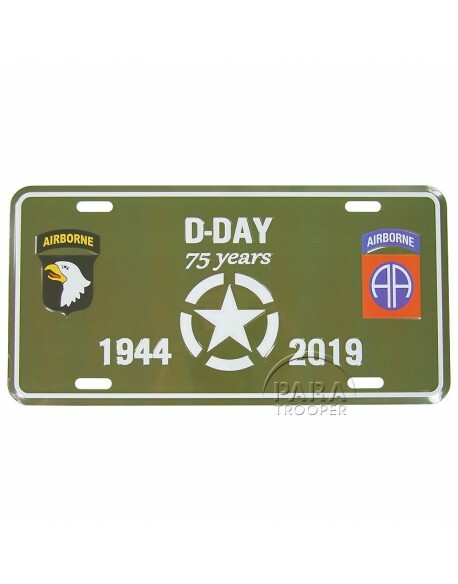 Nice 75th D-Day Anniversary metal vehicle plaque with the 101st & 82nd Airborne Divisions insignias, perfect for your vehicle or your museum. 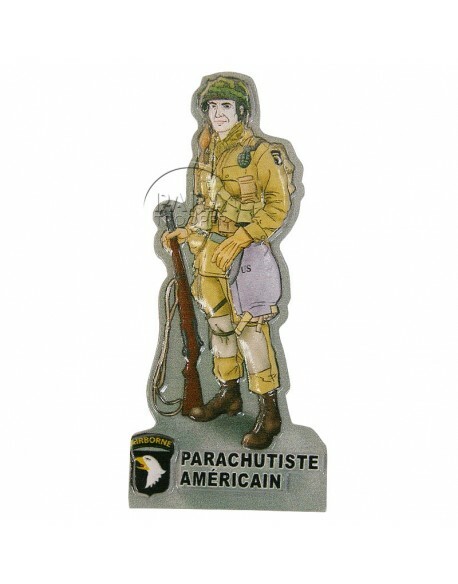 Pack of 4 patches in the effigy of the 75th D-Day landing in Normandy with the 101st & 82nd Airborne Divisions. Diameter: 8 cm / 3.1". 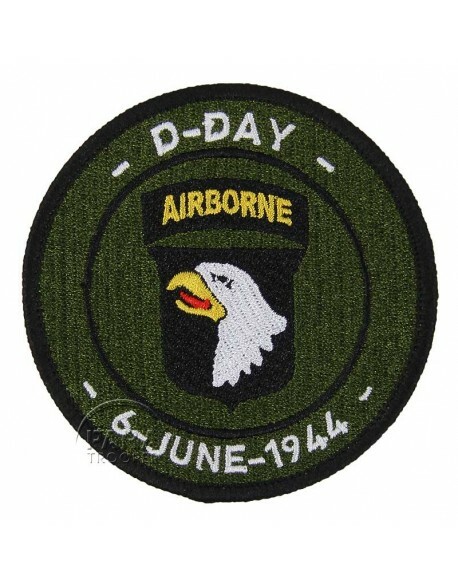 Embroidered round insigna of the 101st Airborne Division marked D-Day 6 June 1944. Diameter: 8 cm. 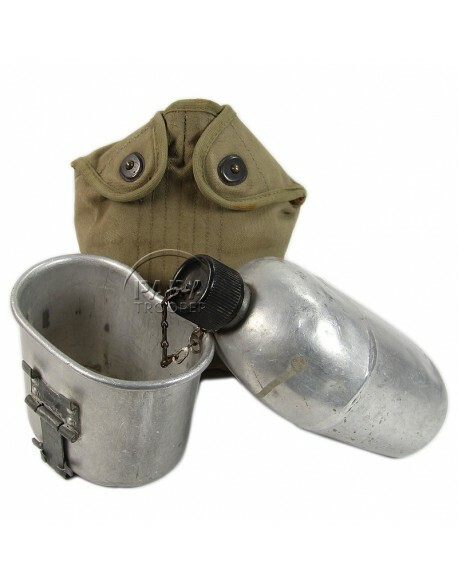 Reproduction of the German gas mask canister, in metal, delivered with its two canvas straps (long one and small one), dated and camouflaged. Perfect to complete your mannekin or for re-enactment. 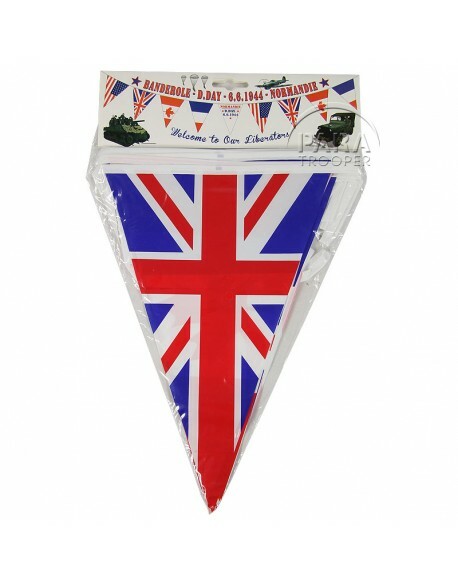 Allied flags banner with one pennant marked Normandie D-Day 6.6.1944. Length: 6m. 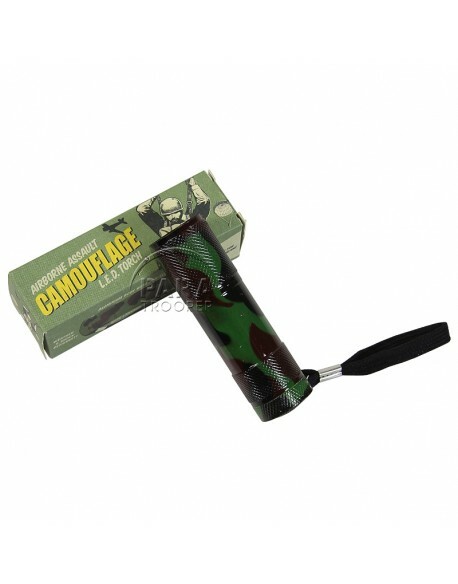 Small lamp, leds, camouflage with an aluminum body with non-slip grip. Weather & shock resistant! 9 L.E.D bulbs for extra bright beam. Requires 3 x AAA batteries, not included. 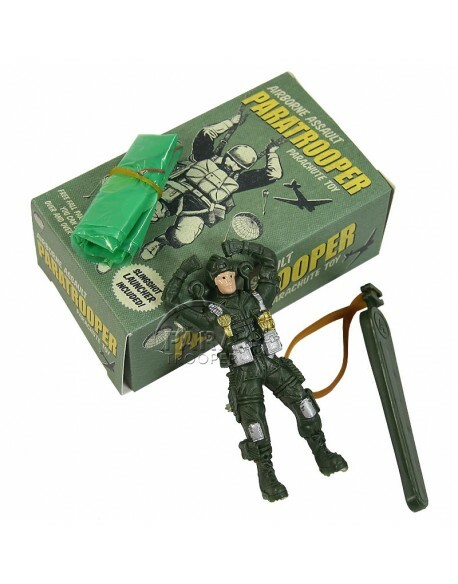 Free fall parachute toy in its vintage box. You can use over and over again ! Slingshot launcher included. Genuine WWII morphine syrette, empty. Morphine syrette issued in WWII first aid kits to medics and paratroopers. Genuine WWII US, T-shovel, shortened, M-1910. 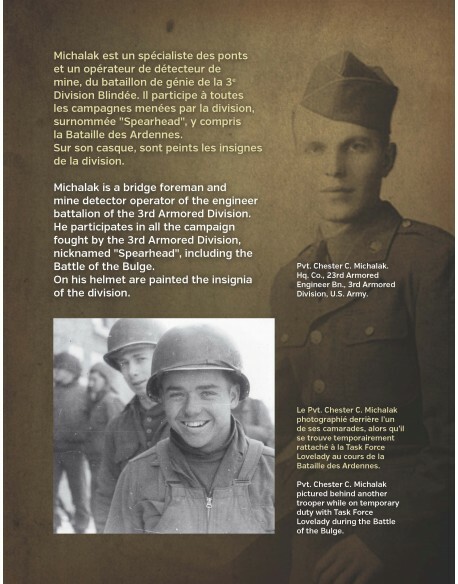 Recovered on the field in Normandy. Genuine WWII US M-1936 rubberized field bag dated 1942 and manufactured by Ken-Wel. 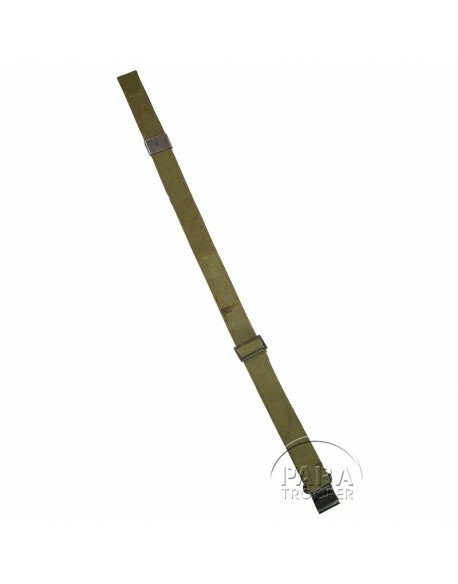 Genuine WWII US canvas sling for M1 Rifle Garand in Light OD color. Dated 1943 by the manufacturer S.M. 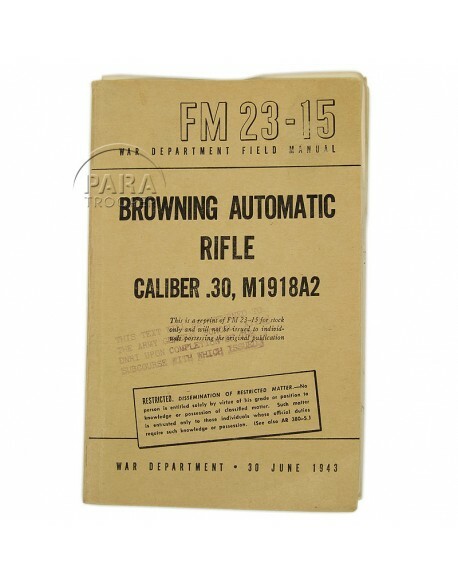 Co.
Genuine post-WWII Field Manual of the Browning Automatic Rifle M1918A2. Printing in 1947. Superb genuine WWII USAAF pilot seat parachute Type S-1. 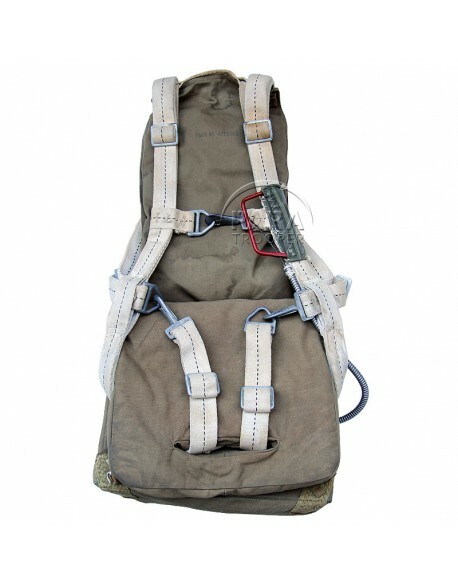 The seat pack manufactured by Reliance MFG Co. is dated June 8, 1943 with parachute seat cushion and back cushion, comes with a genuine white harness manufactured by SAAMA. Without canopy. 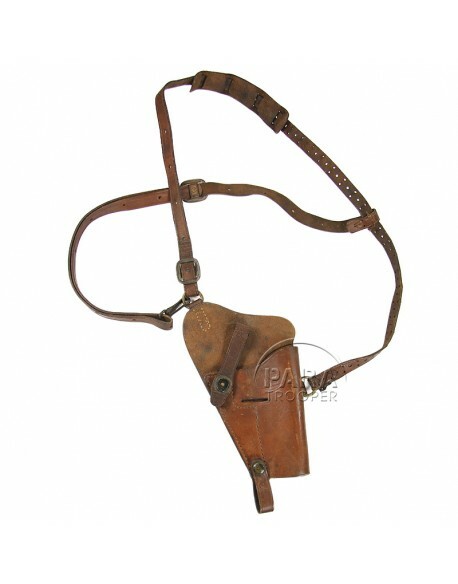 Superb genuine WWII webbing pistol belt issued to all personnel armed with handguns, carbines and submachine guns, as well as to medics. 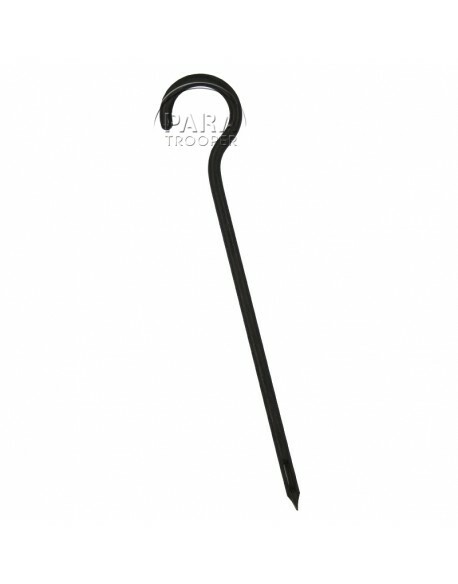 The top row of grommets is for the suspenders hooks, the bottom row for securing various items of equipment thanks to special bent wire hooks. 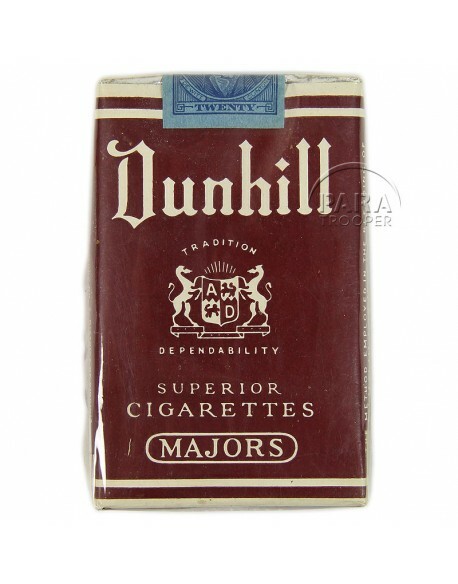 Mint condition, dated 1942, manufactured by NASCO. Genuine WWII strap provided with the M-1936 field bag, dated 1942 by the manufacturer S. Froehlich Co.
Genuine WWII US M1 helmet, swivels bales, manufactured by the McCord with a shell number 1015, original 2nd pattern canvas straps with metal buckle, complete with its liner, blackened A washers manufactured by Seaman paper Co.
Genuine WWII US M-1936 rubberized field bag dated 1942 and manufactured by Hamlin Canvas Goods Co. Pair of Genuine WWII US Army type Wollensak binoculars, 6x30, manufactured by Rochester, optical in very good condition, with leather carrying case. 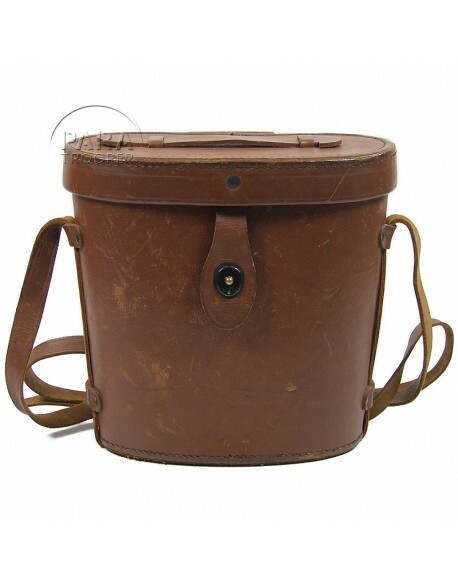 Genuine WWII leather binocular case M24, delivered with leather strap. In perfect condition. very hard to find alone. 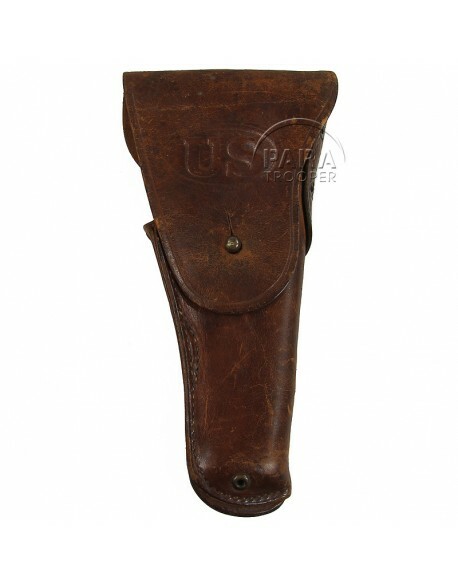 Genuine WWII US belt pistol holster in leather for Colt .45. 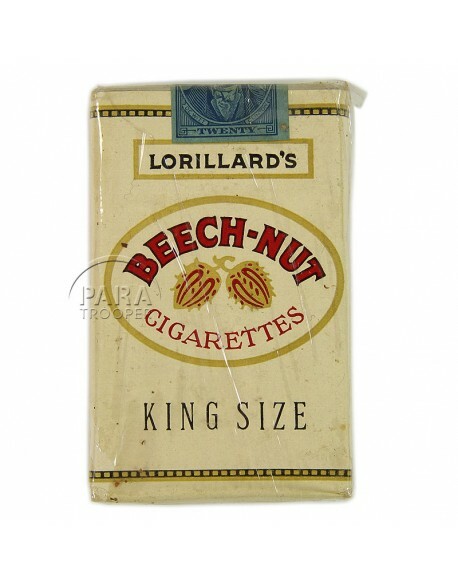 Manufactured by BOYT and dated 1944. 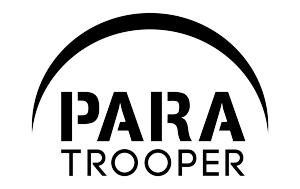 Used by all services of the US Army. Genuine WWII silver bracelet (sterling) engraved with the name a US Navy soldier. Lester E. Thatcher U.S.N. Pair of genuine WWII US dog tags, Richard Shocklee 37605219, T43-44. 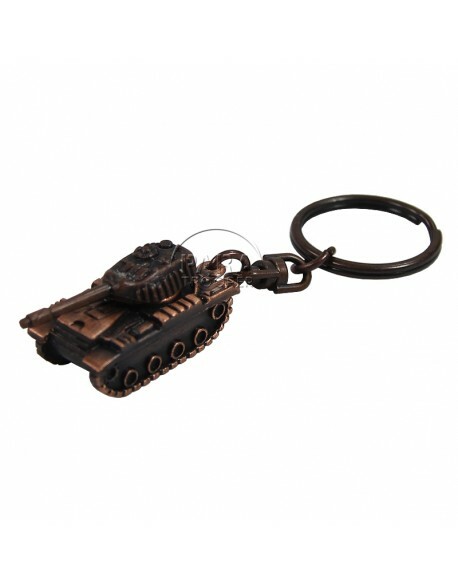 Delivered with its pair of balls chains and a personalized luck-charm. Pair of genuine WWII US dog tags, Dallett R. Fleck 33831537 T43. Delivered with a pair of balls chains. Genuine WWII USM3 trench knife manufactured by IMPERIAL, marked on blade. 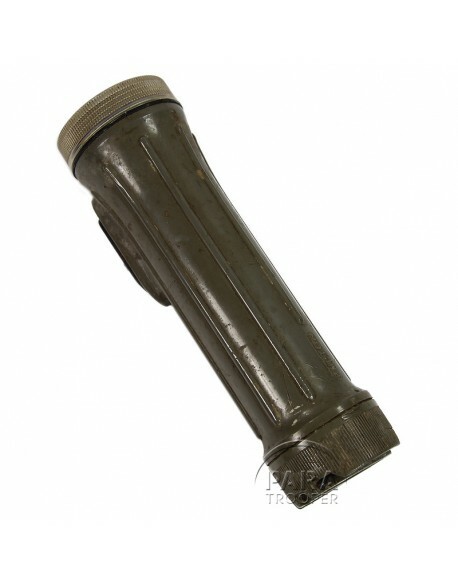 Delivered with its original 1st type USM8 bakelite scabbard manufactured by B.M. 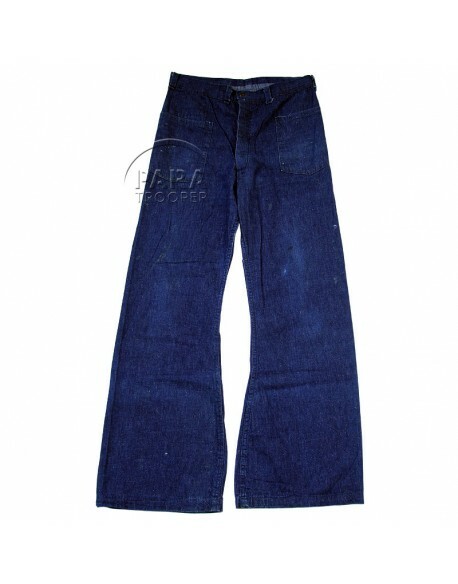 Co. and marked B 1/9 N.
Rare pair of genuine WWII US Navy work attire Jeans trousers. Size 28 US. 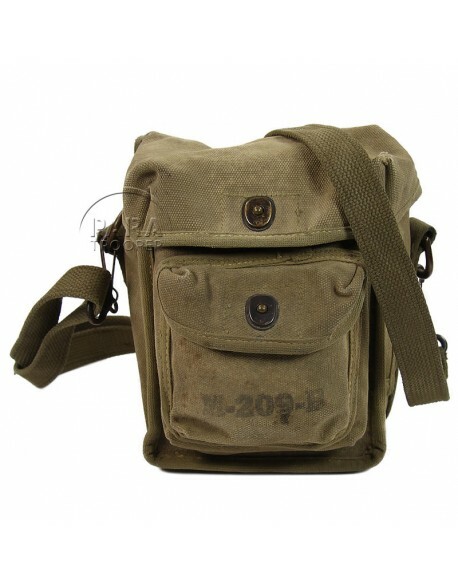 Genuine WWII complete US canteen. 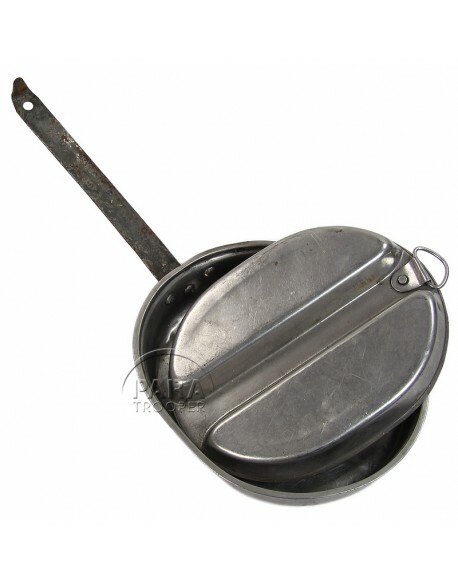 Canteen manufactured by G.P. 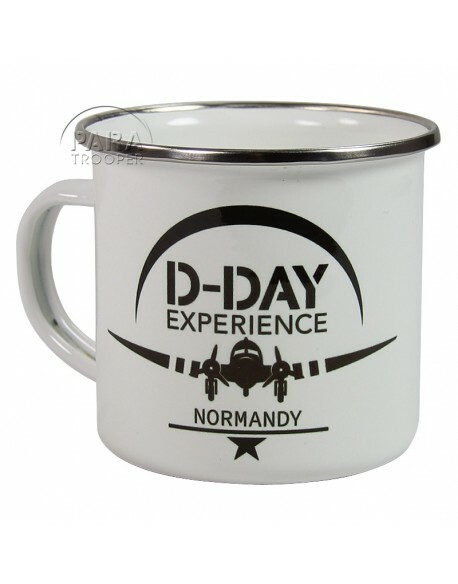 & F. Co. dated 1945, cup in inox. This set is delivered in a very nice khaki cover. Genuine WWII web cover for M-1943 folding shovel, dated 1943, khaki and made by Breslee MFG.Co. with almost readable soldier's name and asn. This is the first pattern cover with non adjustable hook. Genuine WWII British issue rod for Enfield pistol or Webley. 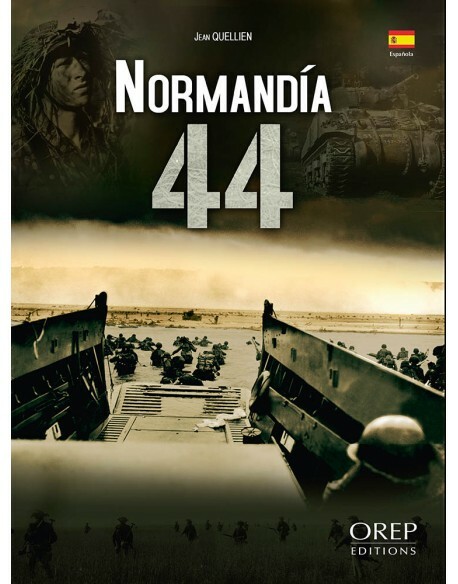 Normandia 44 - by Jean Quellien, Spanish version. 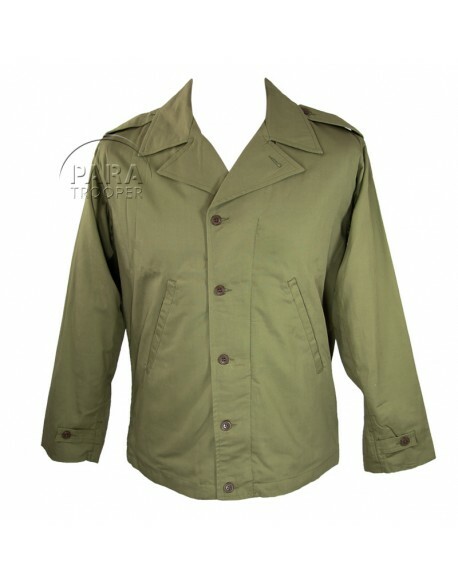 Denison smock, Parachutist, early pattern, officer. Made in USA reproduction of the legendary jump boots made by Corcoran, in the regulation russet shade, with a distinctive toe cap. 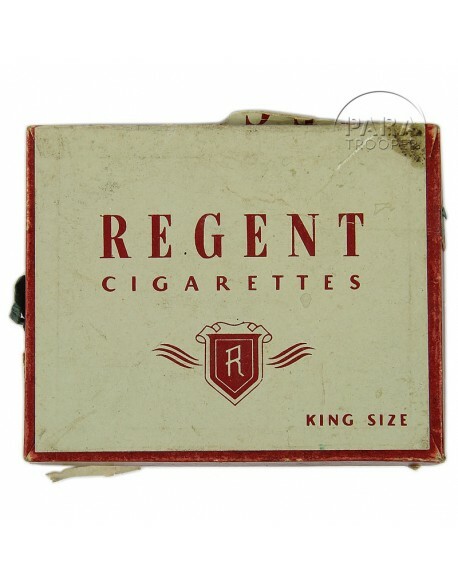 These were authorized in August 1942. 12 pairs of grommets. Slanted heels and taps are rubber. Two distinctive oblique rows of stitching are added to strengthen the quarter, leather laces and Corcoran label. US sizes. 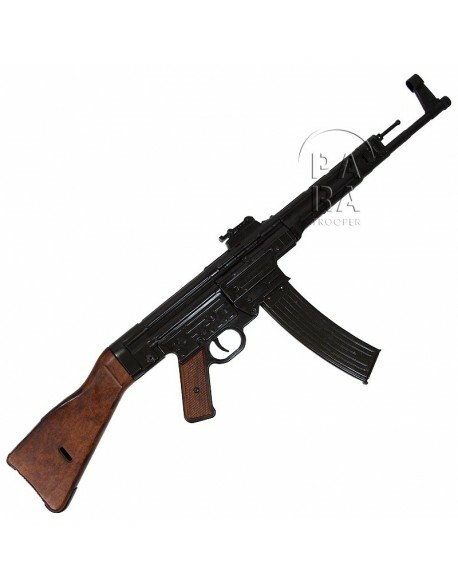 Replica of the famous Sturmgewehr MP 44, in metal and wood stock, with magazine. Arriving on the Eastern Front, the StG44 was used to counter Soviet troops equipped with the PPS and PPSh-41 submachine guns. 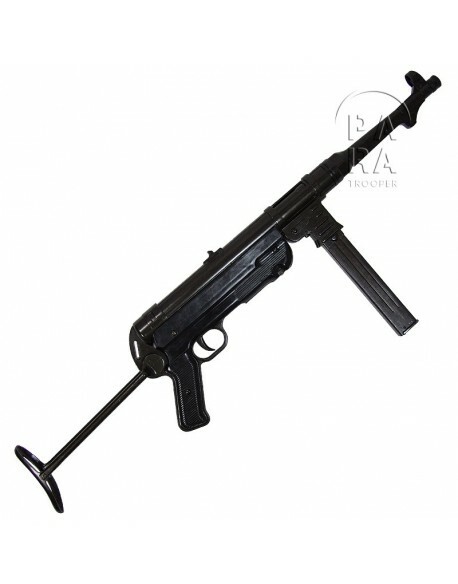 While the StG44 had a shorter range than the Karabiner 98k rifle, it was more effective at close quarters and could out-range both Soviet weapons. 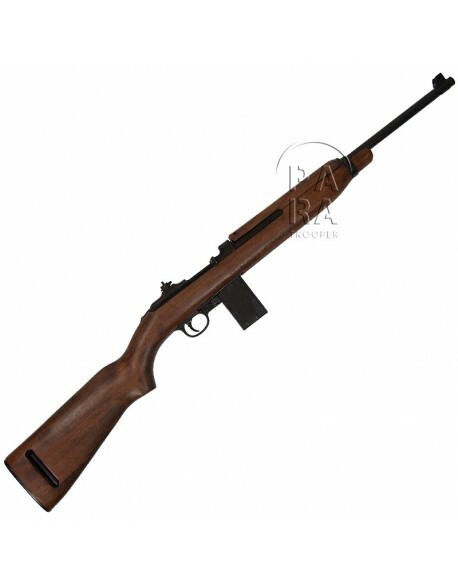 Replica of the famous M1 carbine, 1st Type, in metal and wood. All mobile parts are working, but you can not fire. This is a wonderful reproduction delivered with a magazine and an oiler. 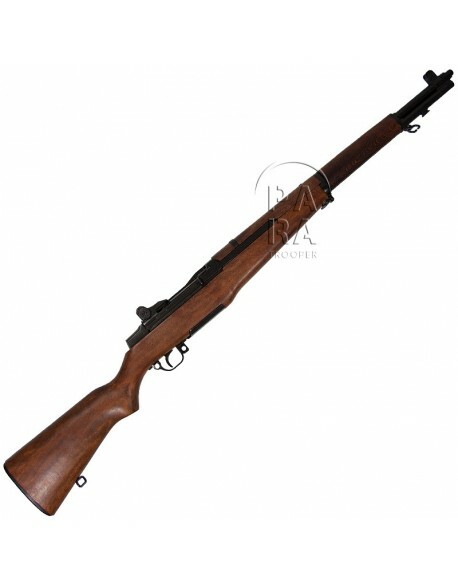 Reproduction of the USM1 Garand rifle. 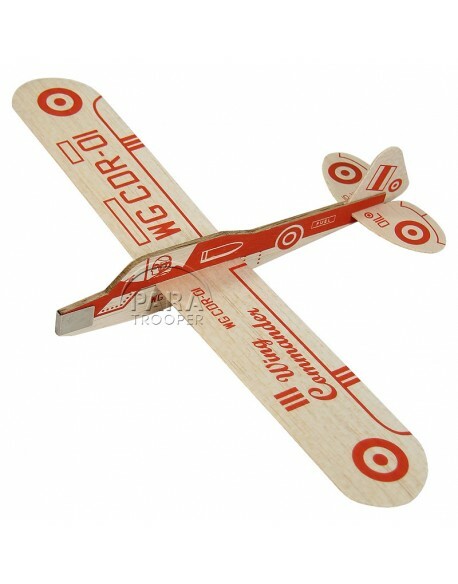 Wooden stock and metal parts. Identical in size. Bolt pulls back and opens the chamber. Sling NOT included. Works but doesn't fire anything. Perfect for reenacting. 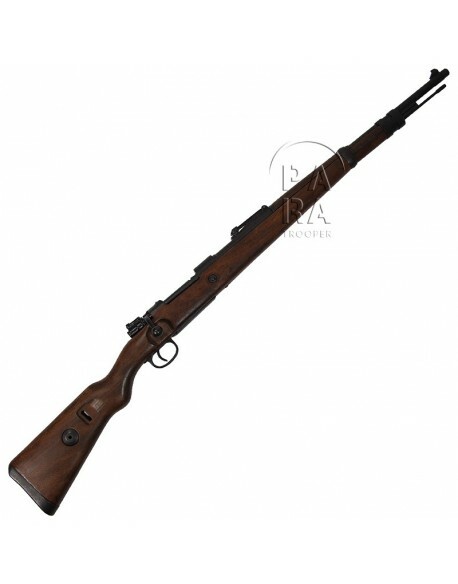 Mauser 98k rifle. Wooden stock and metal parts. Identical in size. Works like a real one but doesn't fire anything. Perfect for reenactment. 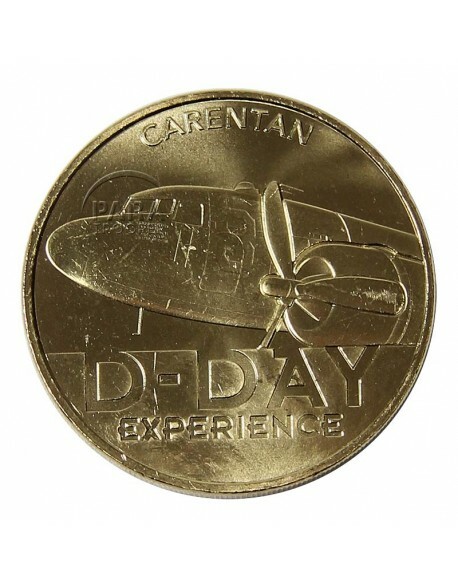 D-Day Experience - Carentan coin, manufactured by Monnaie de Paris (2018). 1942 pattern fatigue trousers. Their only pockets are the two large cargo pockets on the thighs, with flap closure. There is a triangular anti-gas flap behind the fly. 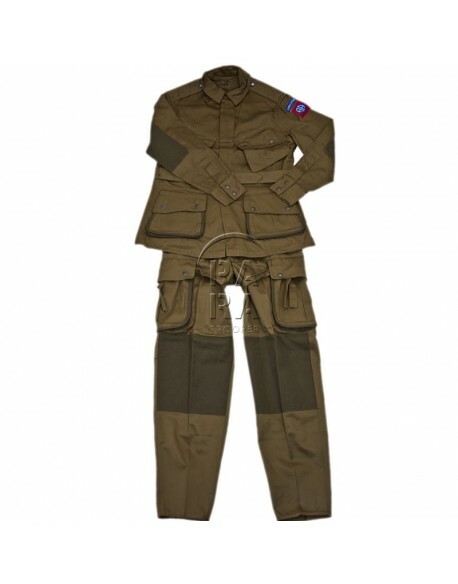 US M-1942 reinforced jump suit. This airborne suit has reinforcement on pockets, elbows and knees. US sizes. 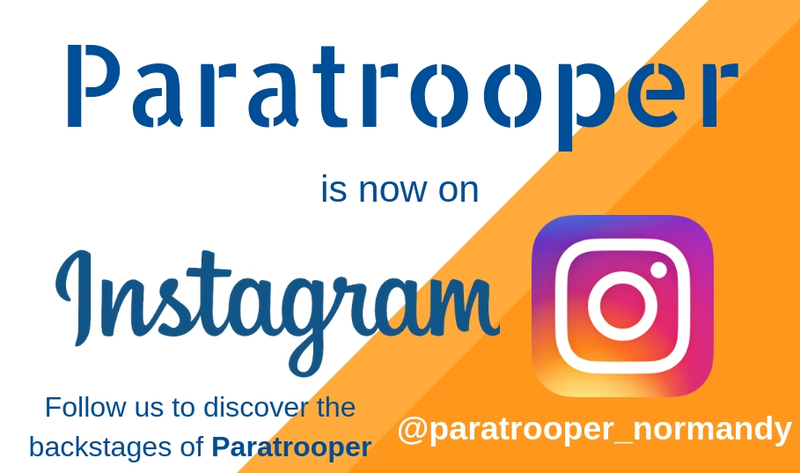 Delivered with a 82nd Airborne Division SSI. 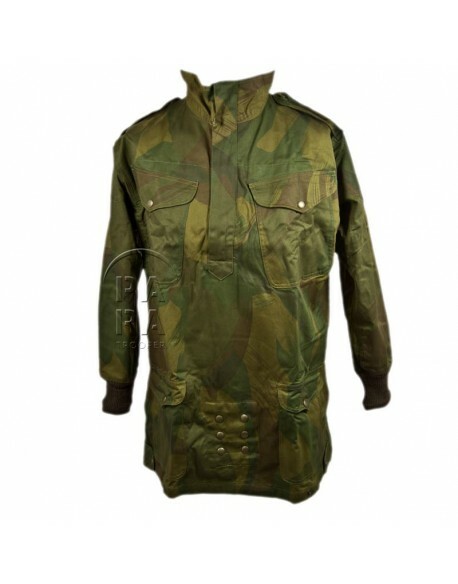 Jacket, Field, M-1941. Short windbreaker-type jacket in windproof and water-resistant cotton poplin with a flannel lining. 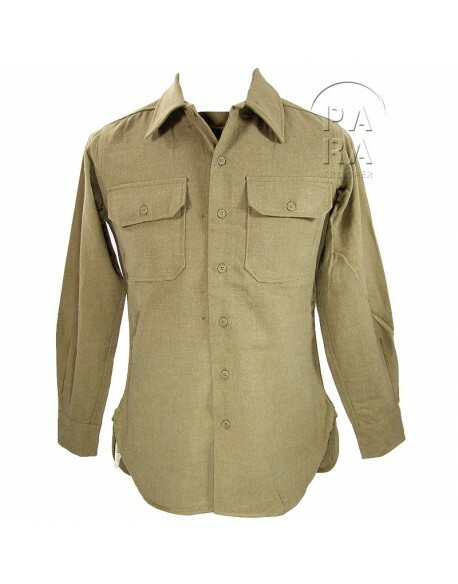 Characteristics: buttoned tabs at the waist and sleeves, front closure by a slide fastener hidden behind a buttoned placket, two wide pleats in the back, buttoned tab under the collar, shoulder loops. US sizes. 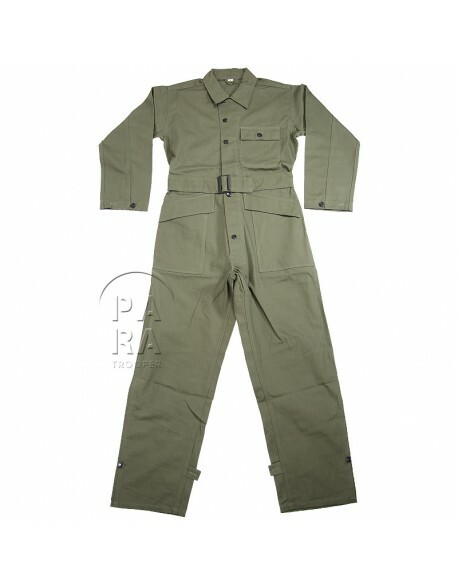 Second pattern HBT coverall. The material is dark green and there is an antigas flap down the front. The two large patch pockets located on the upper thighs and hips are covered with wide oblique flaps. There is a vertical pocket on the right leg to carry a screwdriver, wrench or other tool. All buttons are the customary black tack type.